The water flowed intermittently but intensely. Marked photo of a preserved river channel on Mars, taken by NASA's Mars Reconnaissance Orbiter, with color overlaid to indicate elevation (blue is low, yellow is high.) The range of elevation in the scene is about 115 feet (35 meters). Kite and his colleagues performed a global survey of Mars' ancient waterways, characterizing more than 200 such systems using imagery and other data captured from orbit. They derived age estimates for these rivers by counting craters in the surrounding terrain. The team's work suggests that Martian rivers flowed intermittently but intensely over much of the planet's 4.5-billion-year history, driven by precipitation-fed runoff. The rivers' impressive width — in many cases, more than twice that of comparable Earth catchments — is a testament to that intensity. 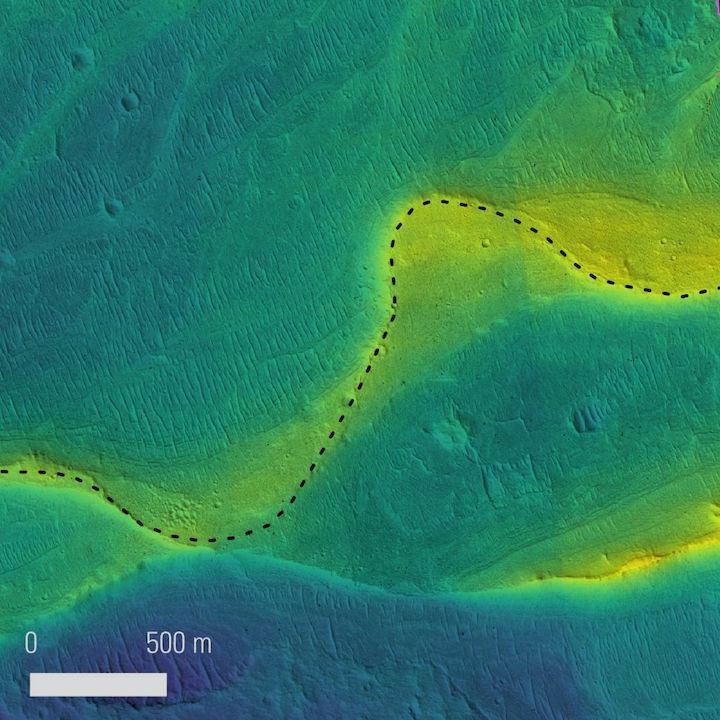 It's unclear how much water Martian rivers carried, because their depth is hard to estimate. Determining depth generally requires up-close analysis of riverbed rocks and pebbles, Kite said, and such work has only been done in a few locations on Mars, such as Gale Crater, which NASA's Curiosity rover has been exploring since 2012. The ancient Mars rivers didn't flow in just a few favored spots; rather, they were distributed widely around the planet, Kite and his colleagues found. The researchers aren't the first to suggest that Mars had multiple wet periods. But their work, which was published online today (March 27) in the journal Science Advances, provides new details that could lead to a better understanding of the planet's climate history and life-hosting potential. "You would expect them to wane gradually over time, but that's not what we see," Kite said in a statement. "The wettest day of the year is still very wet." The new study also shows that scientists still have a lot to learn about Mars' climate evolution. For example, how could the planet's thin atmosphere support heavy precipitation? What process, or processes, drove the apparent wet-dry cycling over long time spans? "Our work answers some existing questions but raises a new one," Kite said in the statement. "Which is wrong: the climate models, the atmosphere evolution models or our basic understanding of inner solar system chronology?" Improved modeling techniques could help answer this question, Kite said, as could the data Curiosity gathers as it continues to scale Mount Sharp, the 3.4-mile-high (5.5 kilometers) mountain that rises from Gale Crater's center. Mount Sharp's many rock layers hold clues about Mars' climate shifts, mission scientists have said. NASA's 2020 Mars rover will also likely contribute in this regard, Kite added. The life-hunting robot, which is scheduled to launch in July of next year, will study an ancient river delta inside Mars' Jezero Crater. If a clearer picture of Mars' climate history does emerge, it could have applications beyond Red Planet research, Kite said. "My hope is that studies like ours will give us an improved understanding of planetary habitability, and then we can generalize from Mars to planets outside our solar system," he told Space.com.